Last week I attended the J.Crew fall preview event in Georgetown, hosted by my good friend Alicia Tenise. I've attended several of these preview events in the past, but always look forward to the fall event. Why? Because fall is my favorite season of course! 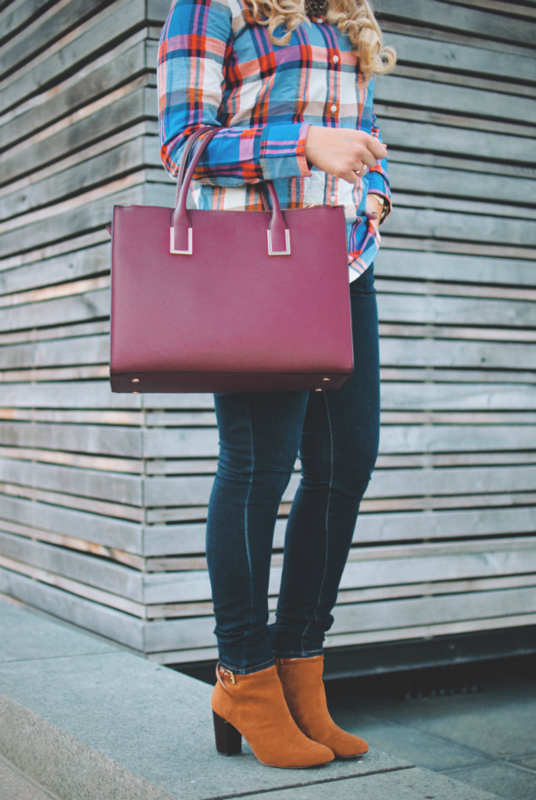 Even more so, I love fall fashion. 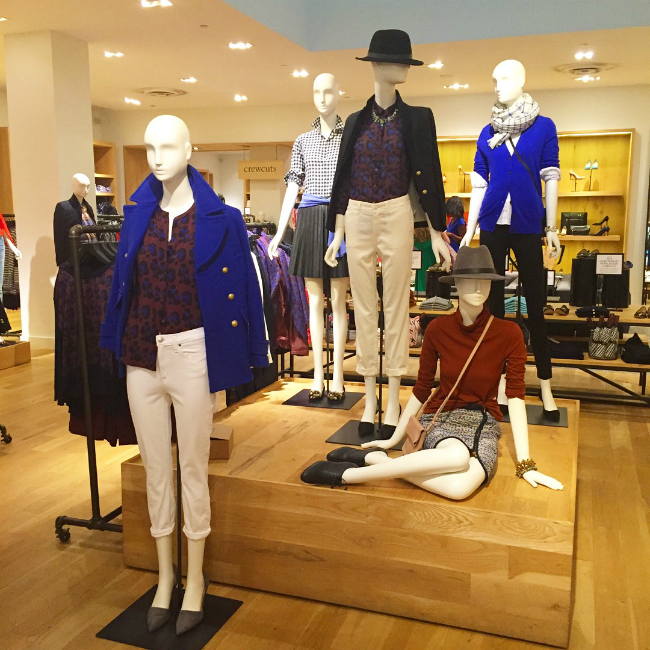 This season's J.Crew collection definitely didn't disappoint. If I had an endless supply of money I'd buy everything. There wasn't one thing I saw, that I didn't like. J.Crew really impressed me this season! One thing I love about a lot of J.Crew's newest arrivals, is that you can wear each individual piece many ways. 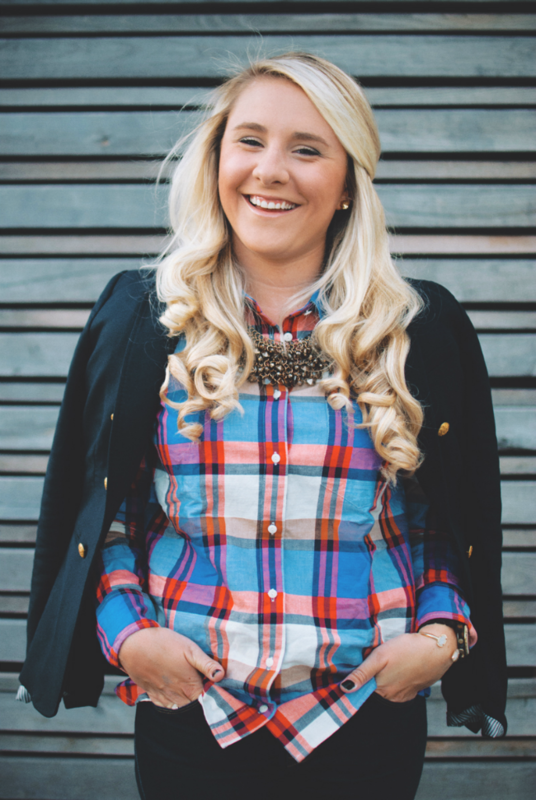 Like this amazing plaid shirt. Of course Alicia and I ended up buying the same thing, ha! But we didn't mind. Why? Because we both have our own individual styles. We both knew that we'd style the same shirt different ways. That's when a great idea came to us. Why not show y'all how we'd style it? So Alicia and I took the same plaid button down and put our own spin on it. Alicia went with a more chic look, by pairing her button down with a leather skirt and heels. 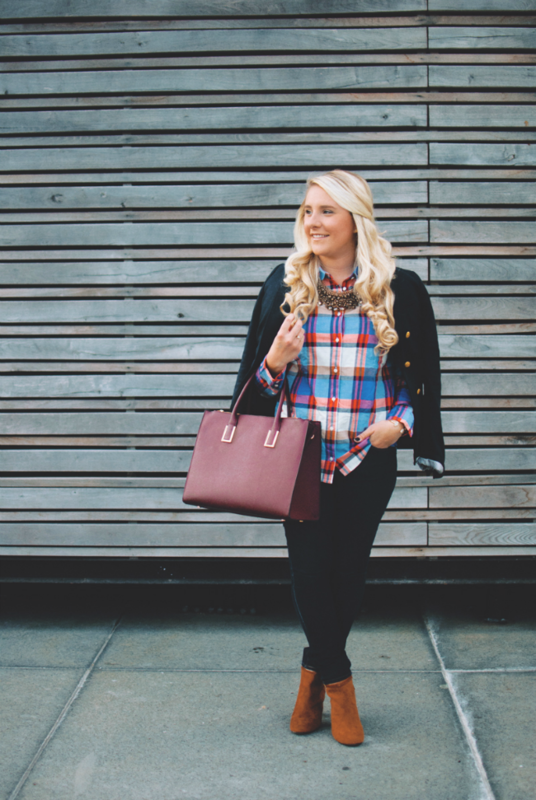 Leather has made a comeback in a big way this fall, so it was the perfect combo. It helped take a rather "male" looking shirt, and feminize it. 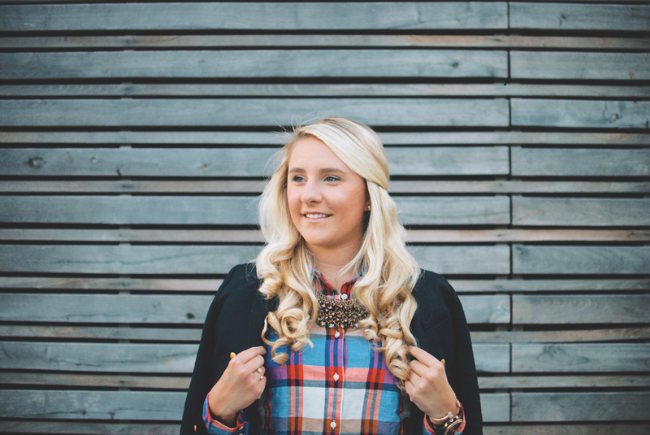 Head over to her blog to see more of her look! As for my outfit, I wanted to stay true to my fall fashion go-to. Jeans and a blazer. 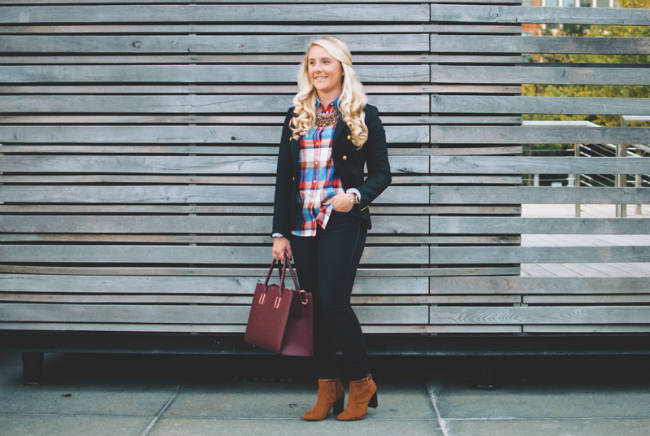 Throughout fall you'll see me in jeans, various plaid shirts or button downs, and a classic blazer. It's so easy and I'm all about versatility. 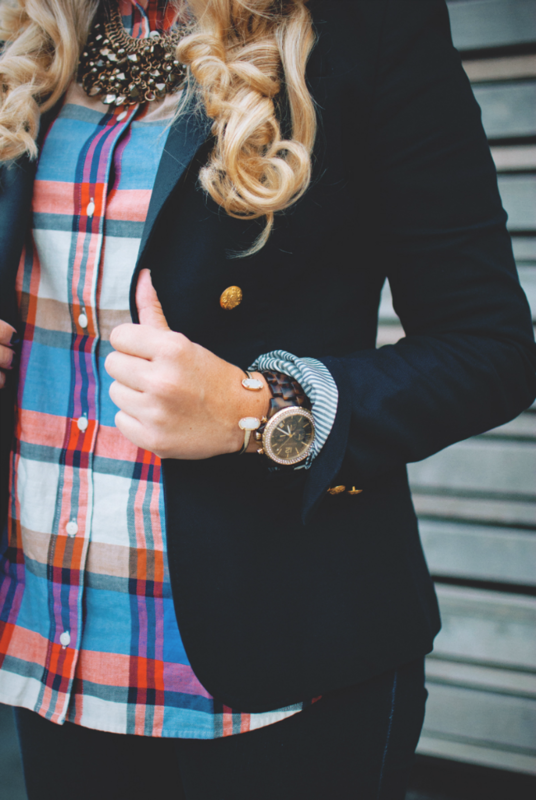 I paired my button down with my favorite skinny jeans and go-to navy blazer. I didn't want to come across too masculine, so I added a pop of sparkle with a statement necklace and threw on a fun pair of booties. You can easily change the feel of an outfit just by adding a few accessories. 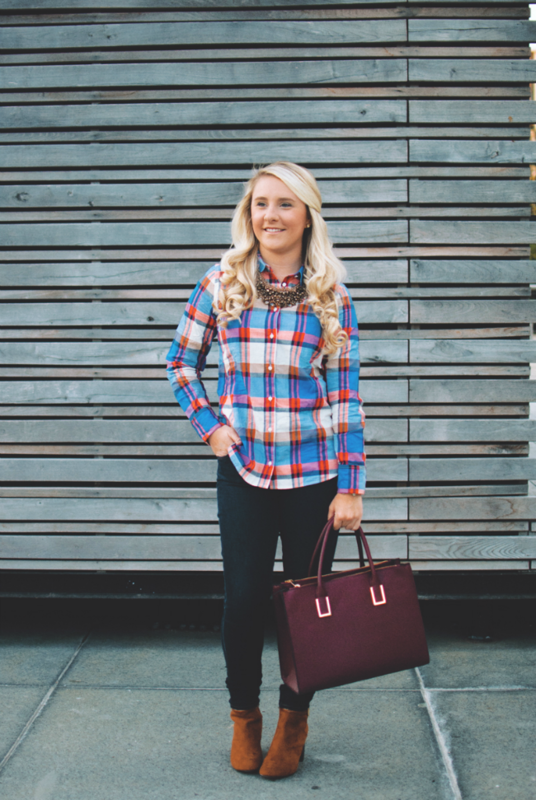 Whether your style is chic or classic, you can certainly take this J.Crew plaid shirt and style it to your liking. 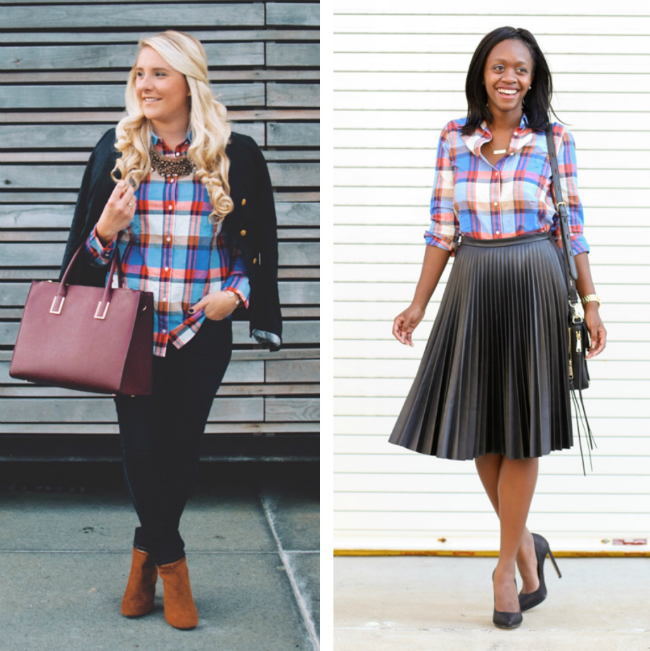 Two bloggers... one shirt... two very different looks! 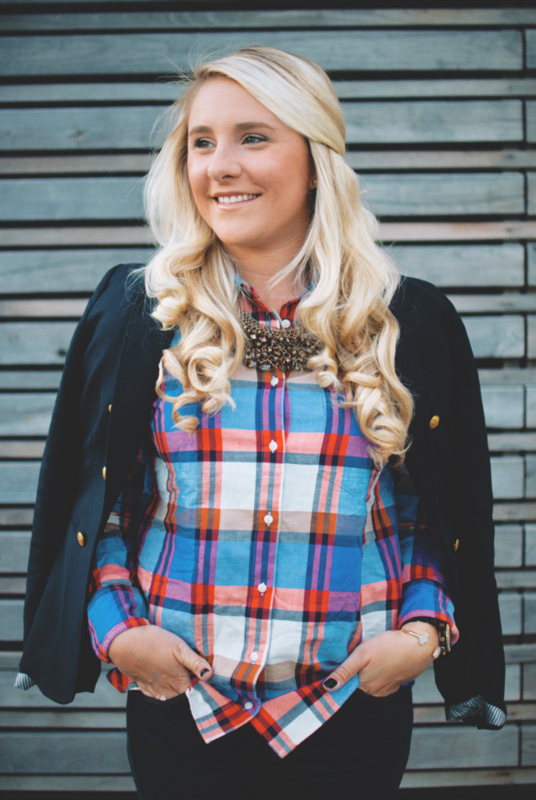 See more J.Crew plaid shirts I'm loving by clicking any of the images below. Love how you styled it! I can't wait to get my blazers out of hiding this weekend and hope they all still fit haha! And those booties are perfection! That's a great top, and you both styled it perfectly! Glad to hear we have similar style Jodie!! Thanks for reading! Thanks girl!! I love a good blazer! !